With the thermometer still flirting with below freezing temperatures, I was longing to be transported to warmer climes even if it was just in the kitchen. Colder weather brings the best citrus selection and the offerings at the supermarket were my inspiration for this dinner. Citrus fruit add brightness to recipes and provide a big dose of vitamin C in our diet at a time of year when we really need it. 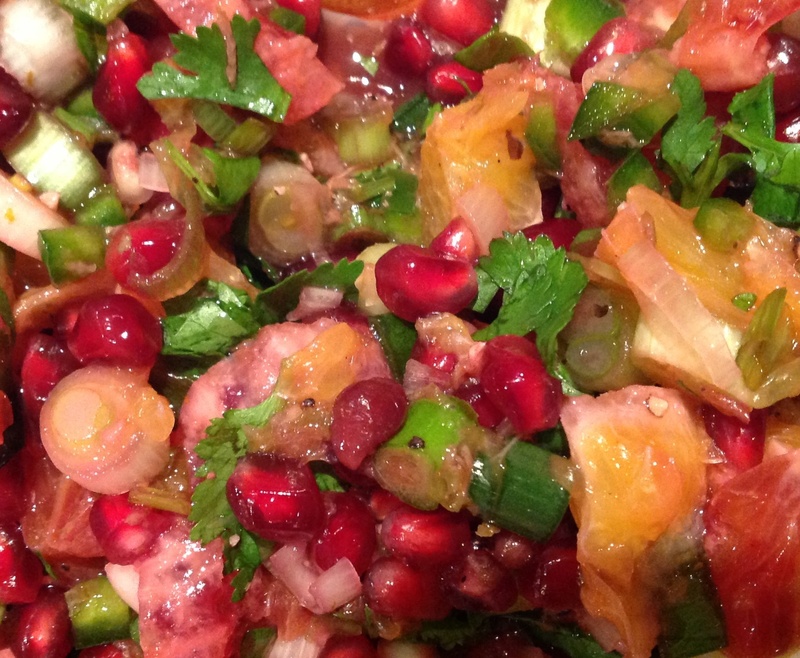 Pomegranates boosts the antioxidant power of this healthy dish. 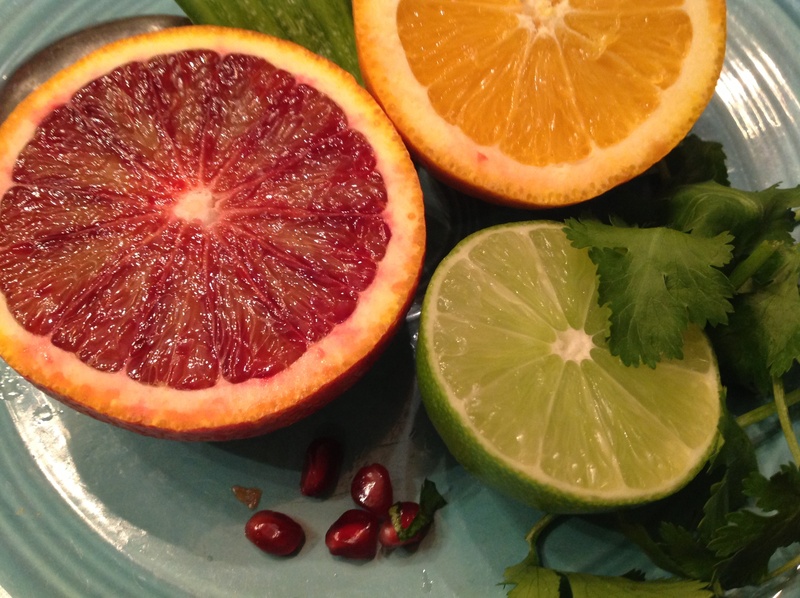 To create the salsa I chose a combination of blood oranges, Honeybells, pomegranate, lime and jalapeno for their rich jewel colors. You can substitute whatever citrus fruit you prefer or have available. Wake up your taste buds and take them out of hibernation with this invigorating dish. Plus you’ll feel like you are actually sticking to your resolutions of eating healthier just as your resolve is weakening! A win-win. To make salsa: using a sharp knife, peel oranges and remove all the bitter white pith. Working over a small bowl, cut between membranes to release the fruit segments, catching the juice. Cut into 1/2 inch pieces. Combine all remaining ingredients and mix gently. Salsa can be made up to a day ahead but it is best served fresh. While flavors of the salsa meld, heat 2 tablespoons of olive oil and 2 tablespoons of butter in a frying pan. Sauté 2 fillets of fish at a time, turning once, about 3 minutes per side, until fish is opaque. If your BBQ grilll is not buried in a foot of snow as ours is, or if you can sweet talk someone into grilling in the snow, you can grill the fish instead. Transfer to a serving plate. Spoon salsa over fish. Serve with a side of vegetables and a starch. We served steamed broccoli with a side of brown rice and quinoa. Add a wedge of lime on the side. 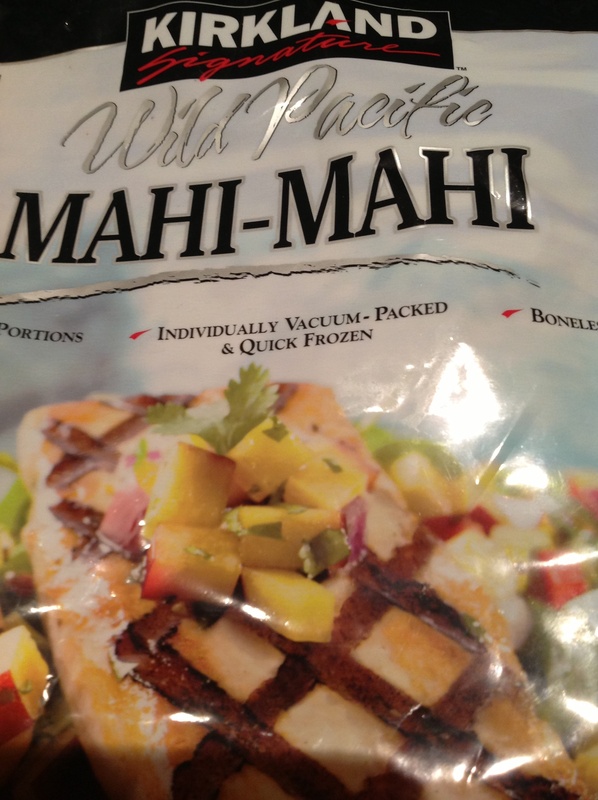 A fast and healthy dinner to transport you to the tropics in the heart of winter. A feast for the eyes too! 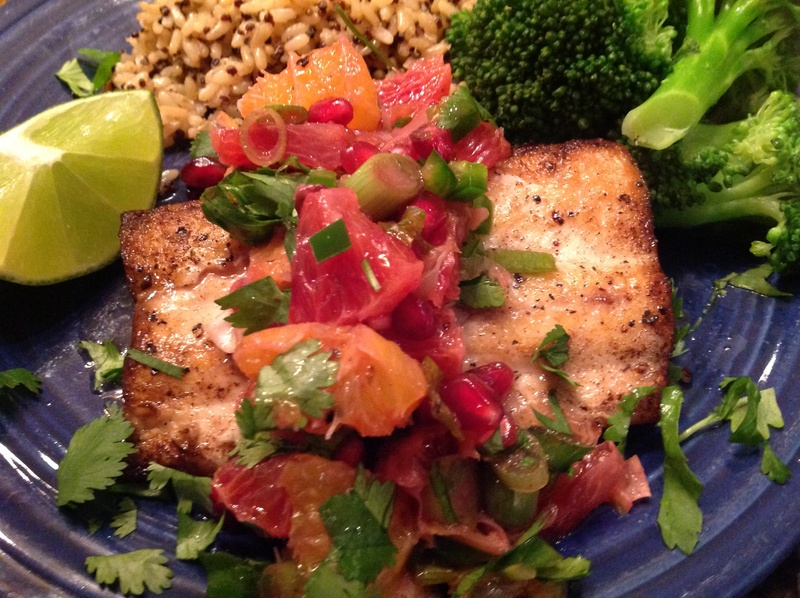 This entry was posted in Recipes and tagged blood orange, Mahi- mahi, main dish, pomegranate, salsa by Johanne Lamarche. Bookmark the permalink. This I made up myself and it was soooooo good!